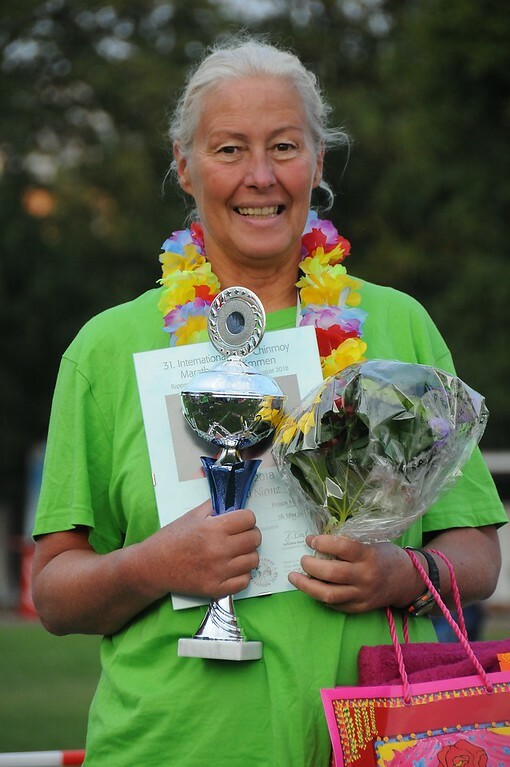 First place women masters at the Sri Chinmoy Zurich lake marathon swim 2018 (no other masters lady finished this year 🙂 – conditions were quite tough, I only had under 2 minutes to the cut-off of 12 hours! Nov. 2018: I was all set for Sept. 2018: Basel 24 hour race done in May, training weeks in Dover (including an 8+7 hour back to back swim) and Portugal (2x 6 hours), Lake Zurich Marathon Swim (12 hours) in August, a few long bike rides, a last cold water training week in Edinburgh ahead – everything seemed fine. Then in my last 7 hour swim in Dover, before heading to Edinburgh, I started to feel dizzy after the 6th hour, and very dizzy after 7 hours. Something was not right. I barely made it to the bus without collapsing, pulse racing. I had never experienced anything before. The next morning I felt better, but not ok. I bumped into heart surgeon Otto Thaning from Cape Town, oldest English Channel swimmer at age 73 in 2014, who had planned to swim again this year but had stopped after 1 or 2 hours (after helping Lewis Pugh for a week on his Long Swim along the length of the English Channel). Otto kindly listened to my story, took my pulse, and simply said: no swim this year! Get a proper heart and lung checkup first, maybe it is only something minor – and then you can still try again next year. My pilot also said: health first – when you get green light from the docotr, do come back anytime! So I was taking a break for a couple of weeks, focussing on other things, and am about to start more serious training again soon. I am only half human without proper physical exercise 🙂 However, I am only planning to go back to Dover in 2020 – and will use my time for a few other things dear to my heart in 2019. Like our Southern Hemisphere Peace Run which is coming up in 2019. 2017: My teammate Tatjana Kvasova from Moscow successfully swam the English Channel with “my”pilot – supported by part of the money he had kept from my booking. Training in Heidelberg is not easy, with no cold open water anywhere near, but that is the fate of many Channel swimmers and aspirants. My idea will be to train much more creatively with more travelling and staying with friends, enjoy new scenic long swims in the colder lakes of Bavaria and Austria or on the North Sea, Baltic Sea etc. early in the year. If 2018 will finally be the year of my “big” Dover-Heidelberg Channel Triathlon, I will be happy – it would be 10 years after my hypothermia-experience in 2008, when I was too skinny and “forced” to swim on a day when I inwardly knew it would not work out, and 8 years after my shorter Dover to Aachen Channel Triathlon. I will definitely concentrate on it and work for it – but the energy and inspiration has to come from within. The Oceans 7 – pursued by quite a number of endurance swimmers including 66 year old Pat Gallant-Charette, or my teammate Abhejali Bernardova from Zlin – does not seem tempting to me right now. But I am sure there is more to come in the next 10 years. A Hawaii Ironman is still on my bucket list. will just be a nice Zurich Lake training swim, after the 6 hours in Zlin in March with 13,5 km easy, and maybe another 6 hour swim in Graz in November. Followed hopefully by some nice training in the Adriatic sea December/January 2017/18. After a surprise New Year`s trip to Croatia with some nice swimming in the Adriatic Sea I strongly felt the best way to celebrate my – and our team`s – 30iest English Channel anniversary coming up on Sept. 9th is by swimming the Channel again (my 3rd time solo). No triathlon, just a simple, joyful solo swim. Not sure if I can better my time again (my speed has gone down, but you never know with tides and wind), but just doing it again a few years older (at age 58) is definitely some kind of self-transcendence. I absolutely enjoyed the CS&PF Dinner in Dover in March with tons of Channel swimming inspiration, and especially the communal Sunday morning “dip” in the refreshing waters of Dover harbour under the watchful eyes of Dover Mayor. And I was actually very lucky to get a free spot so short notice, due to cancellations even a very good one, and with one of the best pilots: Eddie Spelling on Anastasia – pilot of my solo in 2010, of our relay in 2009, and Viyaja`s pilot on her final successful swim in 2007. My tide will be from Sept. 5-12th, weather depending. If anyone is inspired to come and help – there is still room! We have booked a caravan at Varne Ridge Holiday Park, so it will be a very nice stay again! Just be sure you can stay alive on a boat. So training has started and needs to get a bit more intense now. The Zurich lake marathon swim on July 26th will be my major training swim. Looking very much forward to it, after quite a few years of swimming rest now. So far the May/June weather has been helpful – quite cold, so the outdoor pool was fresh and empty, but now a big heat wave is rolling into Germany and the sun is scorching. Good to be in Dover for a few training days from July 10th. This is an in-between year it seems. Organising a few of our German Peace Run days, helping at our 24/12 hour race /German Ultra Championship in Berlin in July, and rowing as a helper for the Zurich lake swim in August (actually got some swimming in at the end, when our solo swimmer decided to stop at Küsnacht after 22 km, and we the two rowing girls got a chance to swim the remaining 4 km to the finish, while he was rowing and enjoying the warm sun with his girlfriend!). Heidelberg trail marathon (as a team) in October. Enjoying running in the hills around Heidelberg for training right now. Hardly any swimming this year. However, 2015 will be my 30th English Channel anniversary year! To swim or not to swim again …. – will see how things (and finances) develop. Still thinking of Cook Straits, but not booked yet. 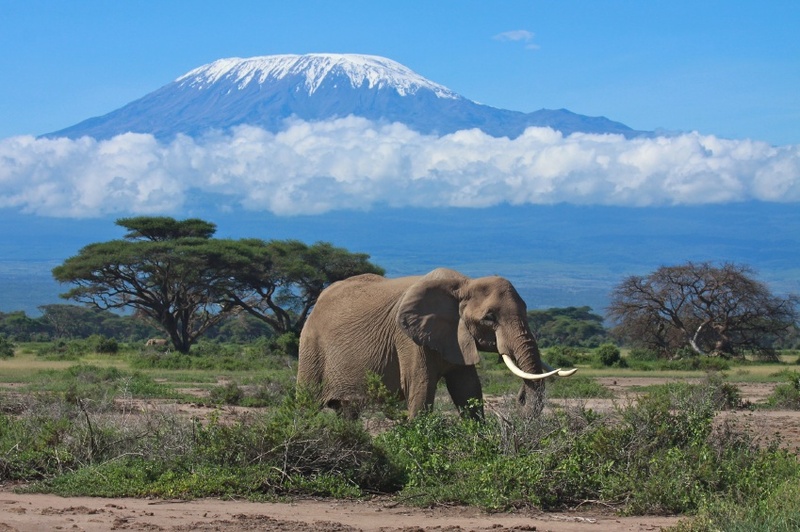 Africa is calling! After swimming to Africa (Gibraltar Straits Oct. 2012) the next step is World Harmony Run /Peace Run Africa 2013 and climbing Mount Kilimanjaro. Flying to Arusha Nov. 4th, Peace Run events with schools on the 6th and 7th in Arusha, start of climb Nov. 8th (6 day Marangu route) with a group of 14 it seems! Carrying the torch of the Peace Run all the way up with the team. More running, hills and stairs: 6 hours Nürnberg, 24 hours Berlin (106 km), “Stairs to Heaven” (Himmelsleiter) up from Heidelberg city to Königsstuhl “mountain”, some higher altitude Swiss mountain hiking in Sept.
Catalina Channel (triathlon to San Diego? ), Ederle Swim N.Y., Cook Straits (triathlon to Christchurch), a faster Channel solo – might inspire me. Too slow for Manhattan Island. After completing Dover-Aachen in 2010, Dover-Heidelberg still remains as my goal – but I need a few years’ break, just financially. In April 2011 I finished my first multiday race ever! 342 km – 213 miles in 6 days – a good start! My immediate next goal was the 6 day race in New York end of April 2011. I have wanted to do a multi-day-race for ages – but I have always been limited in my running. After my Channel-triathlon experience, however, where I felt stronger than ever, I thought I might give it a try – if I manage to loose my extra weight, the 6 days will be an invaluable experience also for my Dover-Heidelberg goal. And I am really looking forward to an event where I am not just by myself most of the time! The 6 day race will be on a loop course – so there will be people around all the time – the other runners, the helpers, counters etc. Here a 6 day race-report by Urs Maurer, Switzerland, vegetarian like me, no, actually he is even vegan! And sorry, the report is only in German! Finished the 6 day race – with all 4 goals completed: staying happy throughout the race, hanging in there for all the 6 days, completing at least 300 km and 50 km per day, and if possible, transcend that. Here more infos about the 6 & 10 day Self-Transcendence Race 2011 including results, photos and comments. The 12 hour Self-Transcendence Race in Berlin on July 9th, the Zurich Lake Aug. 7th, kind of easy-going both it looks like – but Berlin was cancelled, and when I started a little training for Zurich, I pulled a muscle. So, an easier year it seems. In quiet moments I am still seeing myself on top of the cliffs at Varne Ridge or in Dover harbour, looking across the Channel towards France. 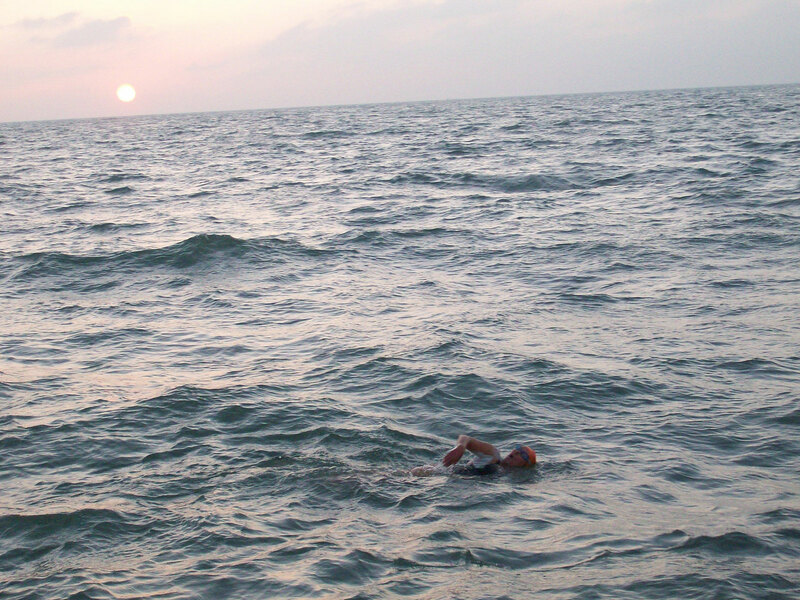 I am identifying with friends due to swim the English Channel solo soon: Abhejali from Zlin booked for the first tide of July 2011 (she made it), and Jatnasheel from Heidelberg for the last tide of July (he did not). 2012 may be another easy year, with another, better 6 day Self-Transcendence race in N.Y. in April, and with more focus on the 25th anniversary of the World Harmony Run, helping organise and participating. Friends have been trying to encourage and inspire me to do the Catalina Channel soon, and invitations to New Zealand have been coming in. But I still need to win the lottery (the only thing is, I am not buying tickets). And I am wondering how much of a chance a not so fast swimmer like myself might have to “conquer” the Cook Straits? Today, Sept. 3rd 2011, is my Channel anniversary of last year. Right now Eddie on Anastasia is out with a girl attempting the Arch to Arc Enduro(wo)man triathon London-Paris – and I am getting infected. There is still a slot for Sept. 2013 and several for 2014. It is “only” 5000 GBP, half of it to be paid on reservation. I guess the next goal is just to work hard and get back into training. There is still time for Dover-Heidelberg later – to top it all off!